Narcissus Florals is a full-service florist on the New Jersey Shore. Narcissus specializes in event and wedding flowers with delivery available from New York City to Cape May, NJ. We believe flowers are one of the most important elements of your wedding day. Whether it is simple elegance or abundant beauty, our talented design team will meet your every need, instilling confidence and providing the professionalism you should expect. We are honored to be a preferred florist of many area venues and winner of the 2010, 2011, 2012, 2013, 2014, 2015, 2016, 2017, 2018 and 2019 Brides Choice Award. Call us at (732) 281-0333 for your complimentary consultation. View our pictures by wedding style. See all of what we have to offer! See what people are saying about us our designs and customer service. Narcissus Florals is proud to be an industry leader and premiere florist, specializing in wedding and event décor on the New Jersey Shore. Our everyday line of custom fresh floral arrangements and gourmet gift baskets are available for same day delivery to Ocean and Monmouth Counties. Accents by Narcissus Florals has been family owned and operated by the Malagiere family since 1989, and is a second generation florist. An award winning florist we are forever grateful to our amazingly talented design team, support staff and customers like you. At Narcissus, it’s not just a flower shop, it’s an experience. We hope we have the opportunity to serve you today! 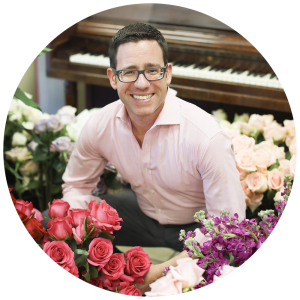 Ken takes great pride in leading the team at Narcissus, a wedding, event and everyday florist on the New Jersey Shore. Notably, Ken and his team at Narcissus have been featured in several industry publications including, Floral Finance, Retail Florist and Flowers and Profits. Additionally Narcissus Florals has received the Couple’s Choice Award (Formally Bride’s Choice Award) from Wedding Wire/Martha Stewart Weddings for eight years running.